1. Preheat oven to 375 degrees. In a mixing bowl cream butter and sugar. Add the eggs and molasses and mix well. In a separate bowl mix dry ingredients together then slowly combine dry ingredients with the wet ingredients. Form dough into 1-2 inch balls and roll into sugar. Place on baking sheets lined with parchment paper and bake for 10-12 minutes. 2. 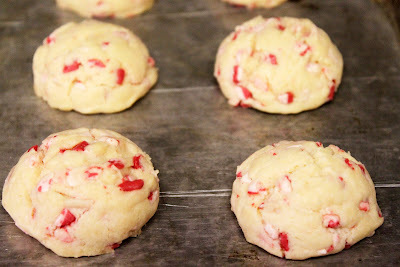 Melt your white chocolate chips and dip half of the cookie into it or drizzle over the top of your cookies and add sprinkles. Place onto wax paper and let dry. Enjoy! My sister in law Angela shared this recipe with me. She says its her absolute favorite dish. It was awesome! I love a good roast and this one is simple, easy to prepare and absolutely delicious! Preheat the oven to 350 degrees. Heat a 2-count of olive oil in an oven proof braising pan or Dutch oven over medium-high heat until smoking. Season the meat well with salt and pepper, put in the pan, and brown for 10 to 12 minutes. Make sure it's really well seared on all sides-this is where the flavor comes from. Take the meat out of the pan and put it on a plate. Add the onion, rosemary, and thyme to the pan and stir and cook for about 5 minutes to give the onion a good sear. Now add the wine, broth, and bay leaves and bring the whole thing to a simmer. Return the meat to the pan. Cover, put the pan in the oven, and cook until the meat is fork-tender, about 2 1/2 hrs. Remove the meat to a platter. Taste the braising liquid for salt and pepper and discard the bay leaves. Slice the meat and serve in shallow bowls atop a big spoonful of mashed potatoes. Top with some of the sauce and garnish each bowl with a drizzle of olive oil to finish. Our cute little neighbor Cooper made these cookies all by himself for our family. His mom later told us that they found the recipe on the cover of a Utah magazine and it received a #1 Christmas cookie award. I love shortbread cookies or Mexican wedding cookies so these were a HIT at our house! Cream together butter and sugar. Add egg and vanilla. In a separate bowl combine flour, baking soda and baking powder. Add dry ingredients to the mixer. Pour baking chips into the cookie dough and be careful not to over mix. Form small cookie balls onto a baking sheet and bake for 8-10 minutes at 375 degrees. *I used a small cookie scoop and was able to make 40 balls. I also baked each batch for 11 minutes; maybe my oven temp is off. 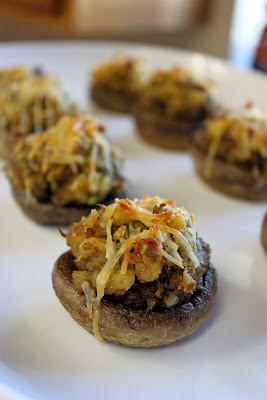 My sister in law Jenny shared this yummy recipe with us. I'm not a huge fan of Italian sausage so we both use regular ground sausage and it works great! In a large frying pan, saute onion and garlic in olive oil until tender. Add sausage and cook until done. Add white wine and reduce until almost evaporated. Add tomatoes and cook 3-4 minutes. Add cream and cook until slightly thickened. Add parsley, Parmesan and season with salt and pepper to taste. Toss with pasta and serve. 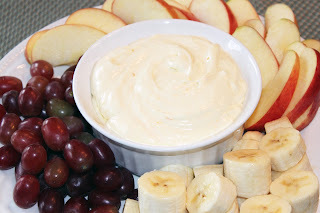 Fruit Dip is such a great idea for any gathering. It's light and refreshing and can be served as an appetizer or with a meal. Or you can be like me and serve it to my son who will eat almost everything all by himself! Blend ingredients until smooth. Serve with fresh fruit. 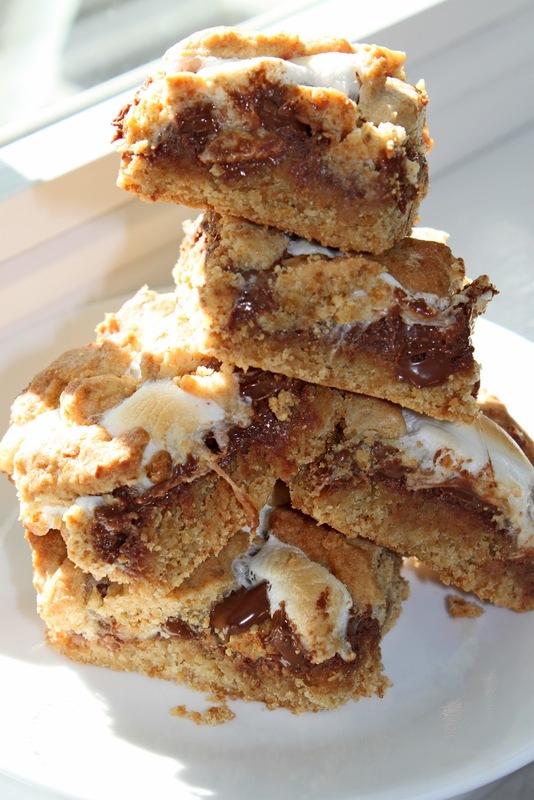 This recipe comes from our good friend and neighbor growing up. Mix all ingredients thoroughly except nuts. Divide mixture and shape into 2 balls. 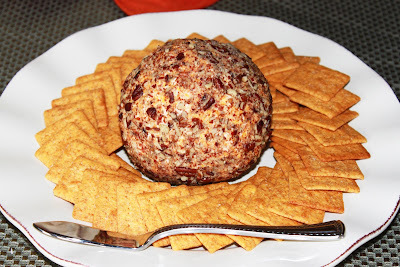 Roll balls in crushed nuts. (I used pecans this time around). Wrap in saran and refrigerate. 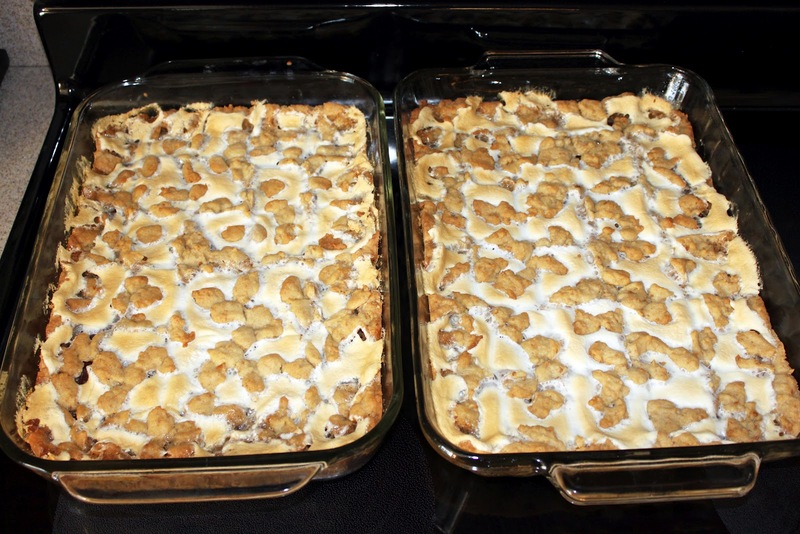 My neighbor shared this yummy Betty Crocker dessert recipe with us and it is delicious! On their website it says it was the Prize-Winning Recipe for 2007 so it's definitely a keeper! Heat oven to 350 degrees. Spray bottom and sides of 9x13 inch pan with cooking spray. Place cookie mix in large bowl. With pastry blender or fork, cut in butter until mixture is crumbly and coarse. 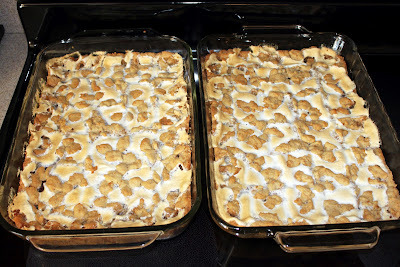 Reserve 1 1/2 cups crumb mixture; press remaining crumbs in bottom of pan. Bake 10 minutes. Meanwhile, in large bowl, beat cream cheese, sugar, four, vanilla and egg with electric mixer on medium speed until smooth. Spread cream cheese mixture evenly over partially baked crust. In medium bowl, mix pie filling and cinnamon. Spoon evenly over cream cheese mixture. Sprinkle reserved crumbs over top. Sprinkle with walnuts. Bake 35 to 40 minutes longer or until light golden brown. Cool about 30 minutes. Refrigerate to chill, about 2 hours. Our friends came over last year for a dinner and planning meeting for our upcoming trip to California. 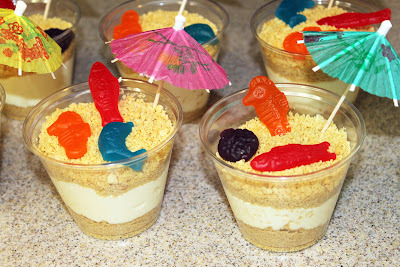 I thought it would be fun for the kids to have a beach themed dessert to get them in the mood for our upcoming vacation! 1. Place the sandwich cookies into a resealable plastic zipper bag, and crush with a rolling pin into crumbs. 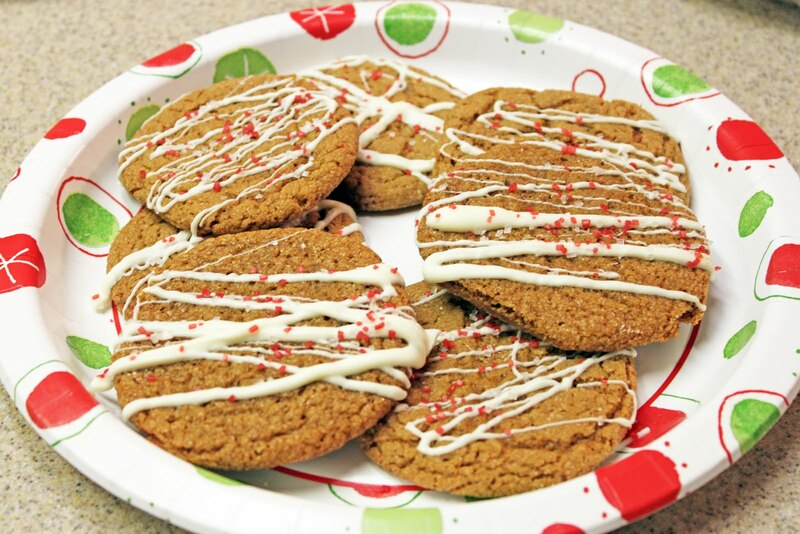 To get finer sand, chop cookies in a food processor. 2. Whisk together the pudding mix with the milk in a bowl, stirring for 2 minutes. Sprinkle about 1/3 of the crushed sandwich cookie crumbs into the bottom of a serving bowl, and spoon the pudding over the crumbs. Smooth out the top of the pudding, then top with the rest of the cookie crumbs to resemble sand. Poke gummy fish halfway into the sand and add a cute umbrella. Refrigerate until serving. I found this recipe on All Recipes. In large, heavy pot, combine soup, water, chicken, celery, onion, salt, poultry seasoning, and pepper. Cover and cook over low heat about 1 1/2 hours. Add potatoes and carrots; cover and cook another 30 minutes. Remove chicken from pot, shred it, and return to pot. Add peas and cook only 5 minutes longer. Add dumplings. To make dumplings: Mix baking mix and milk until a soft dough forms. Drop by tablespoonfuls onto BOILING stew. Simmer covered for 10 minutes, then uncover and simmer an additional 10 minutes. Combine hamburger, green pepper, onion and celery in dutch oven or skillet. Cook over medium heat until hamburger is browned. Drain. Add the rest of the ingredients. Bring to a boil and simmer for 20 minutes. Serve over toasted hamburger buns. 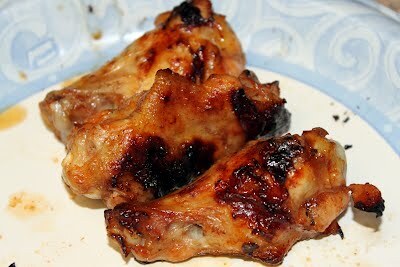 Cut chicken wings into three sections; discard wing tip sections. In a small bowl, combine the hot sauce, cola, soy sauce, cayenne and pepper. Prepare grill for indirect heat, using a drip pan. Moisten a paper towel with cooking oil; using long handled tongs, lightly coat the grill rack. Grill chicken wings, covered, over indirect medium heat for 10 minutes. Turn; grill 10-20 minutes longer or until juices run clear, basting occasionally with sauce. Serve with salad dressing. *I recommend using a charcoal grill for these bad boys! You won't be disappointed! I also poured about 1/4 of the marinade into a gallon zip-lock with the chicken and let them flavor up for about 1/2 hr. In a small bowl, stir together soy sauce, brown sugar, water, and vegetable oil until sugar is dissolved. Place fish in a large resealable plastic bag with the soy sauce mixture, seal, and turn to coat. Refrigerate for at least 2 hours. *I always make a foil packet for the fillet and close it up, leaving a little room for air to circulate inside. This is a super easy Stuffed Mushroom recipe that everyone is sure to love. Preheat oven to 350 degrees. In a skillet over medium heat, chop up sausage and cook until done. Prepare stuffing in a separate pot according to directions on the box. Combine sausage and stuffing into a separate bowl, cover, and set aside. Clean mushrooms and remove stems. Lightly saute mushrooms in a pan with 1 T. butter for 3-5 minutes depending on size. 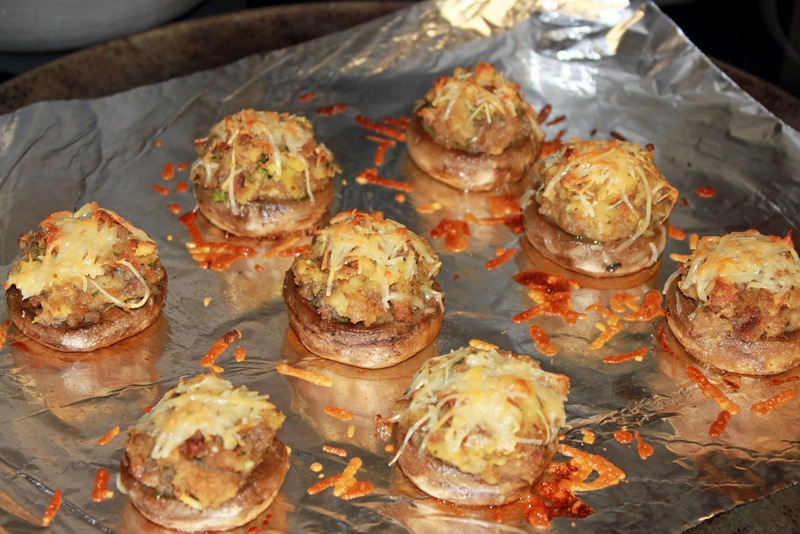 Remove mushrooms from skillet and place on a baking sheet. 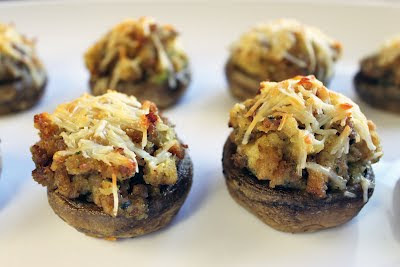 Fill each mushroom with approx 1-2 T. stuffing mix. Top with a sprinkle of Parmesan Cheese and bake in oven until cheese is a golden brown. Enjoy! 2 sticks of butter at room temp. Use the whisk attachment on your mixer and whip the butter (make sure it’s soft and room temp). Add to it the powdered sugar, honey, and then the cinnamon. Whip it good. Scrape the sides. Whip it again. You can keep the jars in the fridge but it spreads easier at room temp! Serve on English muffins, bagels, biscuits, rolls, or toast. Really it’s quite diverse. Dissolve yeast in warm water with a teaspoon of sugar. Add yeast, milk, sugar and enough flour to make a medium batter. Beat thoroughly. Let stand until light and foamy. Add melted butter, eggs and salt. Beat well. Add enough flour to form a soft dough. Sprinkle a small amount of flour onto counter and let dough rest. Meanwhile, grease a large bowl. Knead dough until smooth and satiny and put in greased bowl; turn over to grease top. (I used the dough hook on my Kitchen-Aid to knead this for about 4-5 minutes). Cover and let rise in a warm place until double in bulk. Punch down. Turn out onto a floured board. Divide into portions for shaping; let rest 10 minutes. Shape dough into desired forms. Place on greased baking sheets. Let rise until doubled. Bake at 350 degrees for 10-15 minutes or until golden brown. Baste immediately with butter. Yield: 5 to 6 dozen. *I shaped my rolls by rolling out the dough into a rectangle, about 1/2-inch thick, then I folded the rectangle in half, making it about 1-inch thick. I used my rolling pin and rolled over the dough, ever so gently, just to seal the two halves together. I then used a dough scraper and cut the rolls into squares and placed those on my greased baking sheet. I cut the recipe in half and I got exactly 12 big rolls and baked them for 16-17 minutes. 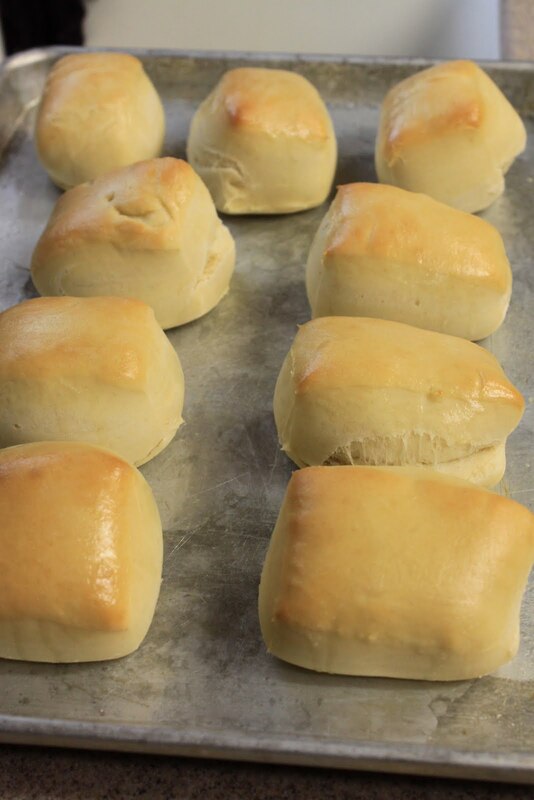 In order to get the 5-6 dozen rolls like the recipe states, you would have to make really small rolls. Dissolve yeast in warm water. Add sugar and egg. Cut shortening into flour and salt mixture. Pour flour mixture over yeast and mix. Let batter rise for 1/2 hour. Heat 1" of oil in skillet to approximately 375 degrees. Pinch off a ball of dough and gently flatten and fry to a medium brown on each side. Let each one rest on a plate lined with paper towels to dry up excess oil. 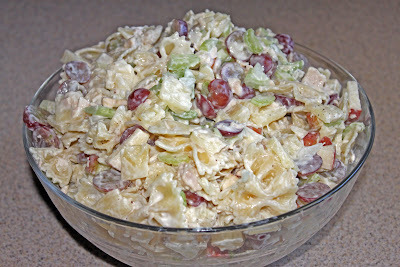 Serve with chili, shredded cheese, diced tomatoes, chopped onion, olives, salsa and sour cream. Scones can also be served with butter and honey for dessert. *In this picture, I quadrupled the batch to take to a backyard bbq. In a large bowl, cream the butter and sugar until light and fluffy. Beat in egg and vanilla. 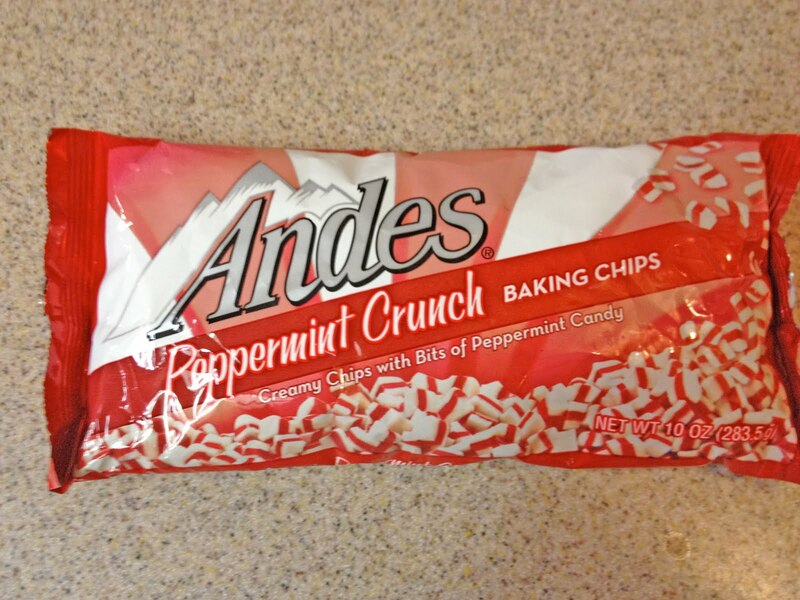 Combine the flour, cracker crumbs, baking powder and salt; gradually add to the creamed mixture. Set aside 1/2 cup for topping. Press remaining mixture into a greased 9-inch square baking pan. 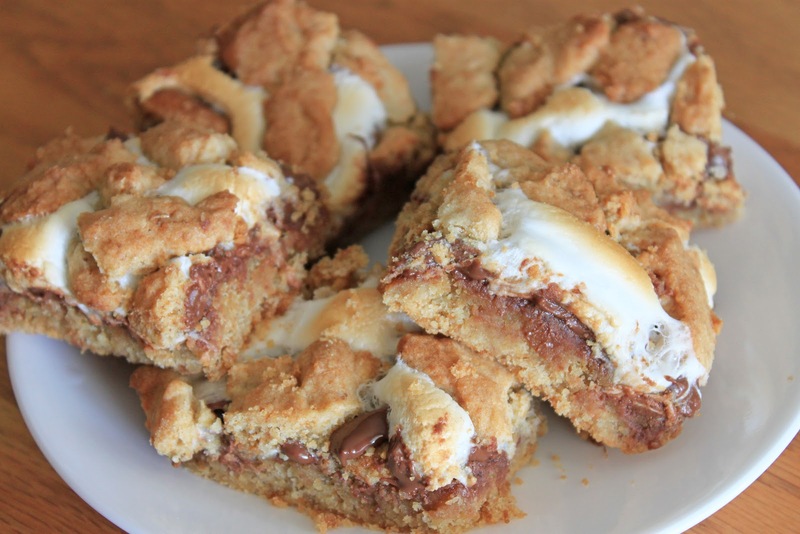 Place candy bars over crust; spread with the marshmallow creme. Crumble remaining graham cracker mixture over top. Bake at 350 degrees for 25-30 minutes or until golden brown. Cool on a wire rack. Cut into bars. Store in an airtight container. *I always replace marshmallow creme for the new flattened rectangle shaped marshmallows. They fit in the pan great with less mess! Cook pasta in boiling water until al dente. Drain & cool. 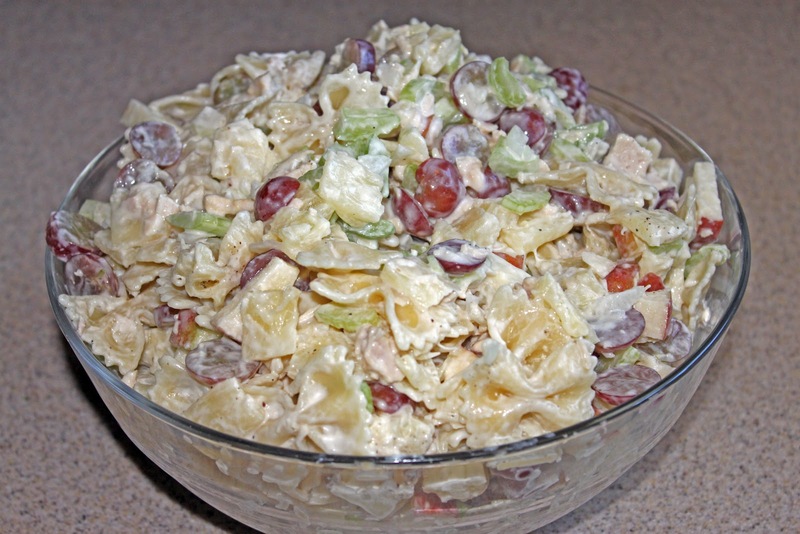 In a large bowl, combine chicken, apple, grapes, celery, pineapple tidbits, green onion, and pasta. In a small bowl, mix mayo, dressing and salt & pepper. Pour over the salad and stir until well coated. Cover with plastic wrap and refrigerate. Just before serving, stir in cashews. *If there are any ingredients you don't like just leave them out. You may also add 1 large can mandarin oranges, drained. This is for a full size recipe to feed a large family or to take to a party. I always 1/2 it to feed my family. I've been feeling a little sluggish lately and thought if I ate more greens, maybe I would feel better :). 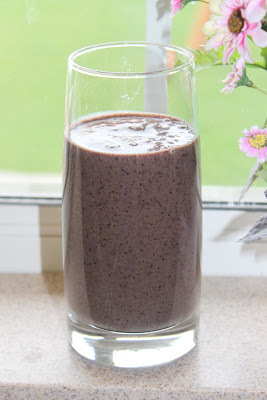 I've heard of people putting spinach in their smoothies but when I searched online for recipes and saw the photos of green smoothies, I was totally turned off. Then I wondered if I could incorporate an ingredient that would make the smoothie more pleasing to the eye. Blueberries are the answer! I love blueberries and seriously you can't even taste the spinach! Just don't let it sit too long, it will slowly turn green on you again. Combine the above ingredients in a blender starting with milk first. Blend until smooth. *You may want to add up to another 1/2 cup of milk depending on how thick or thin you like your smoothies. Serve immediately. I found this recipe on Your Home Based Mom's website. I love key lime pie and lemon bars so when I saw a recipe for a Key Lime Bar...well it makes my mouth water just looking at the pictures. So good! I made them last week and I may just have to make them again this week! Preheat oven to 350 degrees. Combine the crust ingredients except for the pecans into a bowl. Beat at low speed until the mixture resembles coarse crumbs. Add in the pecans. Press mixture into the bottom of an ungreased 9 x 13 pan. Bake for 15-20 minutes or until edges are slightly browned. You don’t want to over cook it. Meanwhile, combine all filling ingredients into a bowl. Beat at low speed until well mixed. Pour filling over hot, partially baked crust. Continue baking for 18-20 minutes or until filling is set. Cool completely. 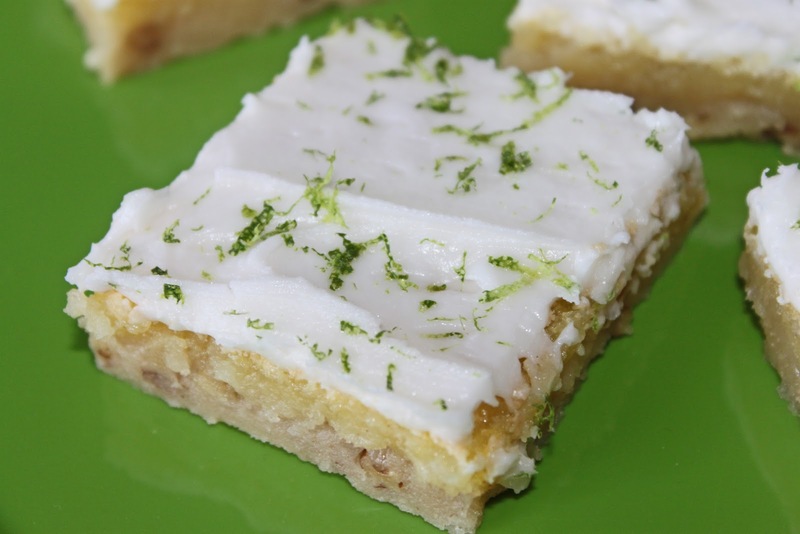 Combine all the frosting ingredients except lime peel in a bowl. Spread over cooled bars. 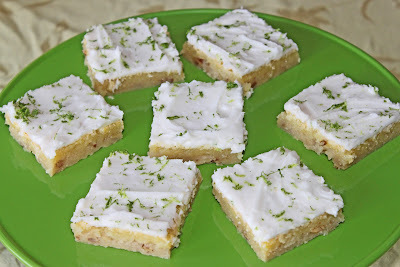 Garnish with grated lime peel. I am always on the hunt for a good chicken recipe that my husband will be willing to eat. He claims to hate chicken so it is one of my life's goals to show him that chicken can taste awesome too! Usually when I think I'm successful with a chicken marinade my husband will say it's good, but will still only eat half of his chicken. This recipe he flat out told me should be a keeper and he cleared his whole plate. Success is right around the corner! In a large glass bowl, mix the cider vinegar, mustard, garlic, lime juice, lemon juice, brown sugar, salt, and pepper. Whisk in the olive oil. Place chicken in the mixture. Cover, and marinate 8 hours, or overnight. Preheat an outdoor grill for high heat. Lightly oil the grill grate. Place chicken on the prepared grill, and cook 6 to 8 minutes per side, until juices run clear. Discard marinade. This will forever be one of my favorite salads. Fresh strawberries + a homemade dressing = delicious! In a medium bowl, whisk together the sesame seeds, poppy seeds, sugar, olive oil, vinegar, paprika, Worcestershire sauce and onion. Cover and chill for one hour. In a large bowl, combine the spinach, strawberries and almonds. Pour dressing over salad, and toss. Refrigerate 10 to 15 minutes before serving. This is a great roll recipe that not only uses ingredients from your long term food storage but you can whip up several batches at a time and keep the roll dough in your freezer until you're ready to bake up some fresh rolls. YUM! Dissolve yeast in warm water. Add butter, milk powder, sugar, potato flakes, eggs, salt and 3 cups flour. Beat until smooth. Continue to slowly add remaining flour. Divide dough in 2 equal parts. Form each part into a round then roll out into a circle on a lightly floured surface. Cut each circle into 16 pie shaped pieces. Form into crescent rolls. Place a sheet of wax paper on jelly roll pan. Arrange rolls on wax paper, cover and freeze for several hours. Remove rolls from freezer and place in a Ziploc freezer bag. Store in freezer. May be frozen up to 4 weeks. To use: Arrange rolls on a baking sheet sprayed with Pam. Cover with plastic wrap sprayed with Pam. Allow to thaw and raise for 10 hours. Easy to do overnight. Bake at 350 degrees for 8-10 minutes. Lightly butter tops immediately after baking. Makes 32 rolls.